The TorqueVario VDE is “without doubt the ultimate electrician’s screwdriver” – reported in the Professional Electrician (September 2011 issue), Calibrated and individually certified to International Standards the ECA, Elecsa & NICEIC have tested the tool and endorse it. 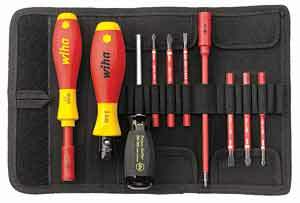 Of particular interest to most electricians will be the electric slimfix and the torque screwdrivers. As well as enhancing the safety of installing terminal screws users will be in good company as Wiha supply TorqueVario screwdrivers into industries such as aerospace, defence and F1.